WE ARE Pi's first task has been to leverage the excitement around the Rugby World Cup, by creating Paddy Power’s very own big match predictor called “The Big Game Hunter”. A psychotic American dentist with a high powered rifle is "entrusted" with match predicting duties in a social campaign and series of online films in which he hunts national team’s icons. If a country’s icon goes down then they are predicted to lose the game by the dentist. At the end of each film, Paddy Power highlight specific match odds for the game. Paddy Power have appointed Amsterdam-based ideas company WE ARE Pi as their Mischief agency, in a competitive pitch handled by the AAR. WE ARE Pi have been entrusted with sparking mischief for the brand, an integral part of Paddy Power’s marketing strategy that kick off the relationship by launching a "Big Game Hunter" social campaign for Rugby World Cup. 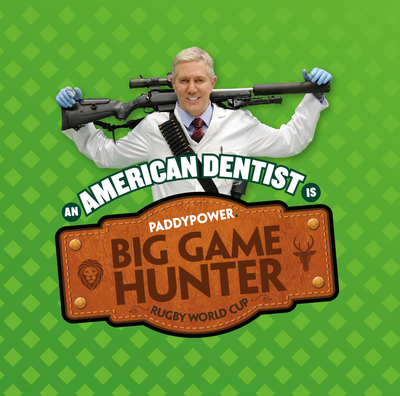 Their first mischievous task has been to leverage the excitement around the Rugby World Cup, by creating Paddy Power’s very own big match predictor called “The Big Game Hunter”. A psychotic American dentist with a high powered rifle is entrusted with match predicting duties in a series of online films in which he hunts national team’s icons. If a country’s icon goes down then they are predicted to lose the game by the dentist. At the end of each film, Paddy Power highlight specific match odds for the game.